BMC Bioinformatics, Vol. 10, No. 1. (2009), 358. Analysis of patients with acute lymphoblastic leukemia (ALL, 1) or acute myeloid leukemia (AML, 0). Samples from Breast cancer patients were subdivided in a "good prognosis" (0) and "poor prognosis" (1) group depending on the occurrence of distant metastases within 5 years. The data set is pre-processed as described in the original paper and was obtained from the R package "DENMARKLAB" (Fridlyand and Yang, 2004). A multi-class data set for the prediction of the disease subtype in pediatric acute lymphoblastic leukemia (ALL). Analysis of colon cancer tissues (1) and normal colon tissues (0). where S is the selected subset with k features and is the average feature-class correlation and the average feature-feature correlation. The importance of features is estimated based on the magnitudes of the coefficients obtained from training a Partial Least Squares	classifier. The number of PLS-components n is selected based on the cross-validation accuracies for 20 random 2/3-partitions of the data for all possible values of n. We use the PLS-implementation in R by Boulesteix et al. SAM (Tusher et al., 2001) is a method to detect differentially expressed genes that uses permutations of the measurements to assign significance values to selected genes. Based on the expression level change in relation to the standard deviation across the measurements a score is calculated for each gene and the genes are filtered according to a user-adjustable threshold (delta). The False Discovery Rate (FDR), i.e. the percentage of genes selected by chance, is then estimated from multiple permutations of the measurements. We use the standard SAM-implementation from the samr-package (v1.25). The empirical Bayes moderated t-statistic (eBayes, Loennstedt et al., 2002) ranks genes by testing whether all pairwise contrasts between different outcome-classes are zero. An empirical Bayes method is used to shrink the probe-wise sample-variances towards a common value and to augment the degrees of freedom for the individual variances (Smyth, 2004). For multiclass problems the F-statistic is computed as an overall test from the t-statistics for every genetic probe. We use the eBayes-implementation in the R-package limma (v2.12). - Loennstedt, I. and Speed, T. P. (2002). Replicated microarray data. Statistica Sinica 12, 31-46. A random forest (RF) classifier with 200 trees is applied and the importance of features is estimated by means of the mean decrease in accuracy (MDA) for the out-of-bag samples. We use the RF implementation from the "randomForest" R-package based on L. Breiman's random forest algorithm. This selection method combines the eBayes, SAM, PLS-CV and and RF-MDA selection schemes to an ensemble feature ranking. The CFS method is not included, because it is designed to remove redundant features, which can be useful for machine learning purposes but might also be undesirable for the direct interpretation of gene selection results (interesting genes might be filtered out, if they have high correlation to other selected genes). All methods receive the same weight and the final ranking is obtained from the sum of the individual ranks. Analysis of prostate cancer tissues (1) and normal tissues (0). Analysis of Diffuse Large B-Cell lymphoma samples (1) and follicular B-Cell lymphoma samples (0). Analysis of cutaneous T-Cell lymphoma (CTCL) samples from lesional skin biopsies. Samples are divided in lower-stage (stages IA and IB, 0) and higher-stage (stages IIB and III) CTCL. Comparison of three classes of Leukemia samples: Acute lymphoblastic leukemia (ALL, 0), acute myelogenous leukemia (AML, 1) and ALL with mixed-lineage leukemia gene translocation (MLL, 3). Features: Our gene selection module provides six supervised algorithms to identify differentially expressed genes in microarray data based on ordinal or categorical class labels (five different algorithms and an ensemble approach combining multiple methods together). The user can either upload his own microarray data (see uploading your own data) or use one of the pre-processed example data sets (to obtain more information on these data sets, please click on the question marks behind the data set labels). Settings: The only parameter that has to be set by the user is the maximum number of genes to be selected. Please make sure to inspect the q-values and other significance scores for the selected genes provided in the output HTML report - even for a small maximum gene subset size not all selected genes might be significant hits. Output: After submitting an analysis, an HTML report is generated providing the results in form of tables and graphs. This includes a ranked list of differentially expressed genes (each column can be sorted by clicking on the column title), confidence measures for each gene (depending on the used algorithm) and boxplots and a heatmap to visualize the expression values of selected genes across different samples and sample classes. If standard gene identifiers are used in the data (Affymetrix ID, ENTREZ ID, GENBANK ID, etc.) and the identifiers can be mapped to online annotation data bases (e.g. ENSEMBLE, DAVID), the selected genes become hyperlinks which lead the user to the corresponding data base entries. If you would like to see an example analysis or obtain more detailed instructions, please have a look out our video tutorial section on the main page. You can download an example data file here (use right-click and "Save as"). The columns must correspond to the samples and the rows to the genes. The first column contains the gene identifiers (a unique label per gene) and the last row the class information for the samples (multiple samples can have the same class label). The rest of the matrix should contain normalized expression values obtained using any of the common Microarray normalization methods (e.g. VSN, RMA, GCRMA, MAS, dChip, etc.). The gene identifiers can be any one of the following: Affymetrix ID, ENTREZ ID, GENBANK ID. You can also use your own identifiers; however, in this case you won't obtain any links to functional annotation data bases. The class labels can be any alphanumeric strings or symbols (e.g. "tumour" and "healthy", or "1","2", "3", or "leukemia1", "leukemia2", "leukemia3", etc.). Samples belonging to the same class need to have exactly the same class label. 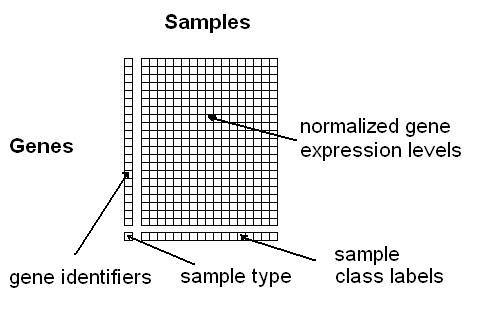 The last row containing the class labels has to begin with a user-defined "sample type"-label, e.g. "phenotypes", "tumours" or just "labels". Optionally, unique IDs per sample can be specified in the first row (if this line is missing, the samples will be numbered consecutively). Please contact us, should you experience any kind of problems when uploading or analyzing your data. This service is free for academic and non-commercial use. We cannot give any guarantee that ArrayMining is free of errors or bugs, but we perform integretiy checks and provide validition measures for each analysis module. If you have any comments or experience problems accessing the server, please do not hesitate to contact us. We take reasonable measures to protect your data, which includes your dataset, tasks, results and all further information that you provide us, and we will not make them available to any third party. We collect some data for statistical purposes, which includes your IP address and the tasks performed. This data is never forwarded to third parties. All your data, apart from data that we keep for statistical purposes, will be deleted after the expiration time. Stay informed about updates and new features on our website by joining our newsletter. Your email address remains strictly confidential and will only be used to inform you about major updates of our web-service (<= 1 email per month). You can unsubscribe at any time by clicking on the unsubscribe link at the bottom of our e-mails. Thank you for subscribing. A confirmation message will be sent to you soon. This module allows you to select differentially expressed genes for microarray data with labelled samples. To obtain instructions click on help.